Land art • West Desert home to iconic Nancy Holt creation. 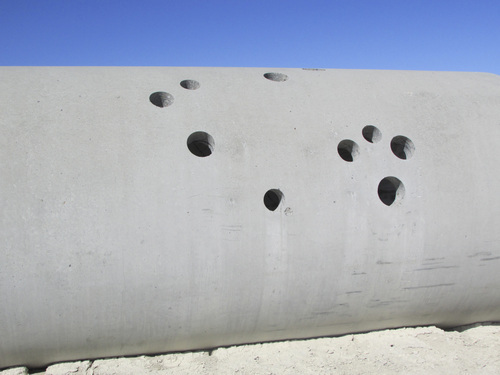 Tom Wharton | The Salt Lake Tribune Holes cut in cement Sun Tunnels tubes resemble constellations. 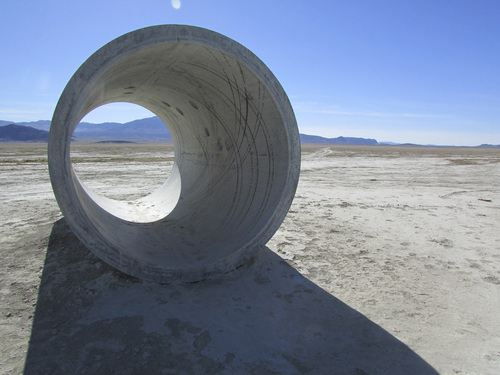 Tom Wharton | The Salt Lake Tribune This is one of the four cement tubes that make up Nancy Holt's land art creation called the Sun Tunnels found in a remote corner of northwest Utah. Tom Wharton | The Salt Lake Tribune Two of the four cement Sun Tunnels, a piece of land art found in a remote corner of northwestern Utah. Tom Wharton | The Salt Lake Tribune A random desert road sign in the middle of the seldom-traveled road to the Sun Tunnels. Tom Wharton | The Salt Lake Tribune Lonely road leads off into the desert from the Sun Tunnels. Tom Wharton | The Salt Lake Tribune Nancy Holt's Sun Tunnels are a land art creation located in a remote corner of northwestern Utah. 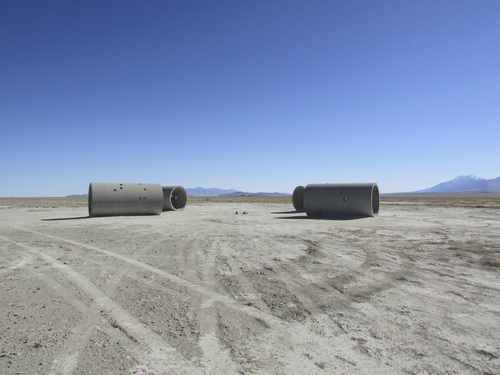 Tom Wharton | The Salt Lake Tribune Nancy Holt's land art installation Sun Tunnels. 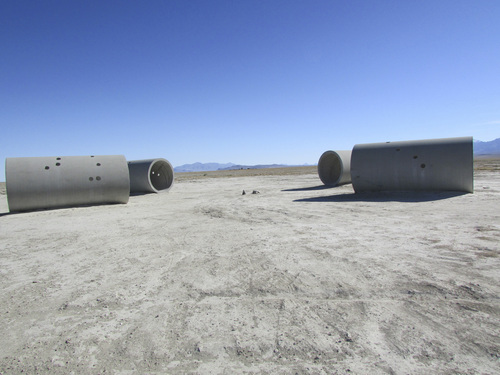 Tom Wharton | The Salt Lake Tribune This is one of the four cement tubes that make up Nancy Holt's land art creation called the Sun Tunnels found in a remote corner of northwest Utah. 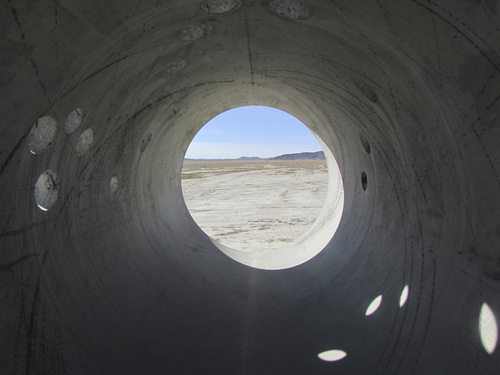 Tom Wharton | The Salt Lake Tribune Bianca Visschers and Noortje van Oostrom from the Netherlands explore Nancy Holt's Sun Tunnels in a remote corner of northwestern Utah. Tom Wharton | The Salt Lake Tribune Tourists take photos of Sun Tunnels in northwestern Utah. Tom Wharton | The Salt Lake Tribune Marielle Van Cromvoirt of The Netherlands explores the Sun Tunnels. 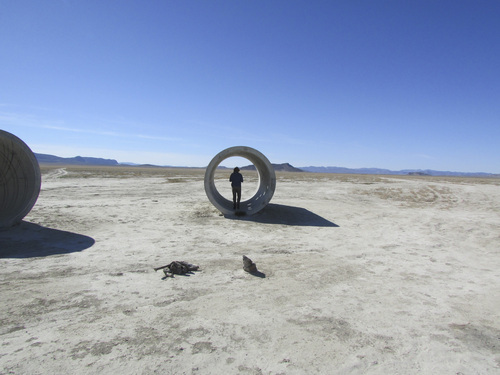 Tom Wharton | The Salt Lake Tribune Nancy Holt's land art installation Sun Tunnels. Tom Wharton | The Salt Lake Tribune Sunlight inside the Sun Tunnels in northwestern Utah. 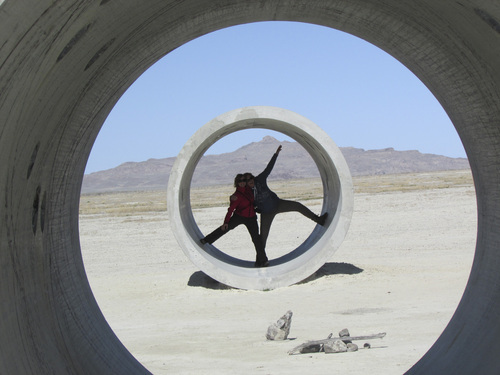 Tom Wharton | The Salt Lake Tribune Nancy Holt's Sun Tunnels are a land art creation located in a remote corner of northwestern Utah. 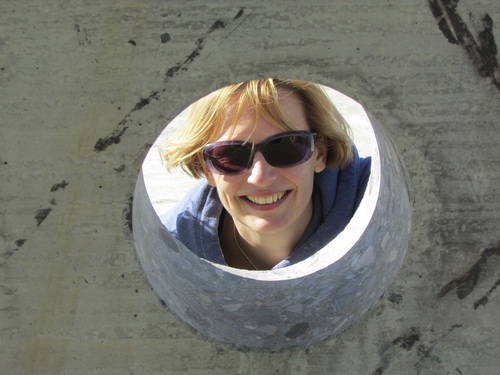 Tom Wharton | The Salt Lake Tribune Dutch visitor Noortje van Oostrum explores Nancy Holt's Sun Tunnels in a remote corner of northwestern Utah. Lucin • On a Sunday morning in mid-April, Dutch traveler Marielle Van Cromvoirt took a quick trip to the Guggenheim Museum in New York City before flying to Salt Lake City. 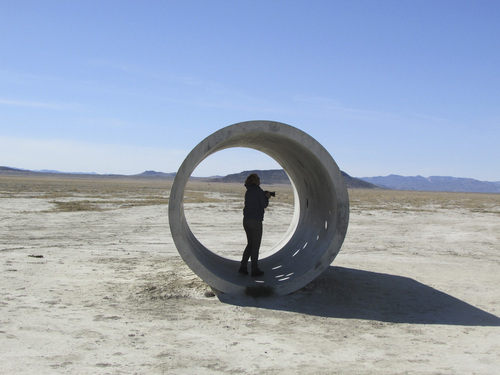 On the next Monday afternoon, she found herself in a lonely and remote corner of Box Elder County viewing Nancy Holt&apos;s iconic Sun Tunnels land art installation in an expansive outdoor setting much different from the bustling big city. In fact, once she and Dutch friends Noortje van Oostrom and Bianca Visschers left the pavement for the approximately 45-mile drive north of Wendover to the remote place west of the Great Salt Lake en route to Holt&apos;s creation, they did not see another human. "It&apos;s unthinkable in the Netherlands to be out so long without seeing anyone," said Van Cromvoirt. "It was amazing." Though most passenger cars should be able to negotiate the dirt road unless the weather is bad, visitors should be prepared for the lonely journey. Grab a full tank of gas in Wendover or at the truck stop station just off Interstate 80 Exit 4 that visitors to the Sun Tunnels take. Make sure you have good tires. Bring extra water and perhaps even a blanket. Cell phone coverage is nonexistent and traffic is infrequent. The rewards, though, are great. Van Oostrom said it felt as though she were driving to the end of the world. "The silence is what I liked," she said. "It was not uncomfortable." 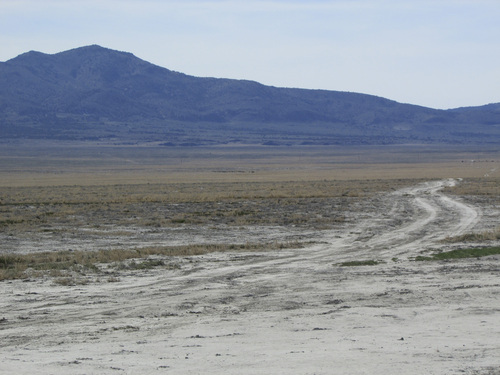 The dirt road passes the eastern base of Pilot Peak and rolls past a few scattered ranches, including the historic TL Bar. An interpretive stop reveals that it crosses the California Trail at one point. There are no signs to the Sun Tunnels. About 44 to 45 miles after leaving pavement, drivers can see an obvious road heading east with one small stake and a reflector. Go about two miles on that and then turn south to the Sun Tunnels. If you reach the ghost town of Lucin, now a fenced area managed by the Division of Wildlife Resources that consists of some wetlands and some foundations of old homes, you&apos;ve gone too far. But that&apos;s not a bad place to stop either, especially since the water often draws migrating birds to the area. 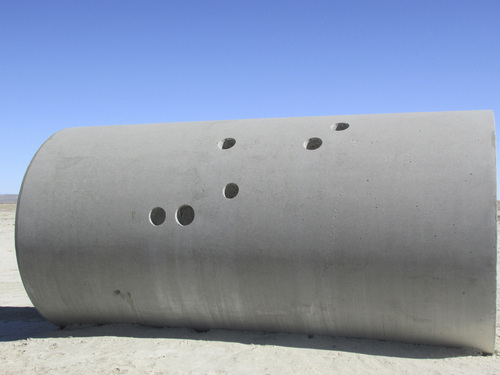 The Sun Tunnels themselves consist of four 18-foot-long, nine-foot-high concrete tubes laid out in an X configuration. 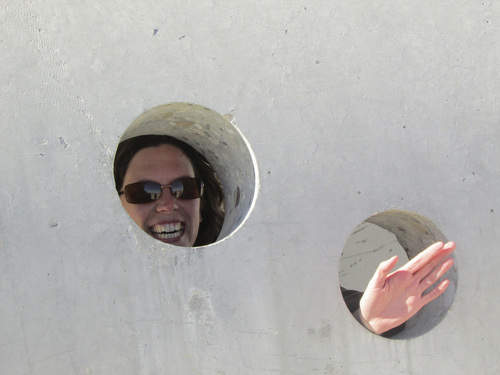 According to the Center for Land Use Interpretation, the tunnels are pierced by holes of different sizes that resemble the pattern of celestial constellations. The tunnels represent Draco, Perseus, Columba and Capricorn. The tunnels line up with the rising and falling sun of the summer and winter solstices. Holt, who died in February, bought about 40 acres for the site in 1974 and installed the work in 1976. According to a story by The Tribune&apos;s Sean Means, Holt and about 30 other people celebrated the piece&apos;s opening on June 21, 1976, marking the summer solstice. The artist told Means she needed an open, vast space with vistas in every direction. The site fits that criteria with lots of room to spare. "In choosing the constellation for the holes, I wanted only those with stars of several different magnitudes, so that I could have holes of different diameters," Holt wrote for artforum.com. "Depending on which of the 12 astronomical charts I consulted, the number and positions of the stars in the constellations varied, increasing my options considerably. Each constellation also had to have enough stars, and to encompass the top half of a tunnel with some holes at eye level on each side, so that the viewer could look through the eye-level holes from the outside and see through the holes on the other side of the tunnel." In exploring the four tunnels and taking photographs inside and out, Visschers seemed fascinated. "It was clever and well thought out," she said. "I loved how she picked the place where to put it. It seemed like simplicity, but it wasn&apos;t simple." The effect seemed particularly beautiful late in the afternoon when the sun was low in the western sky and there were view clouds in the sky. Looking through each tunnel in different direction, the empty land proved to be a fitting gallery for the work. "When you&apos;re out in a place like Sun Tunnels, the desert is so vast, so overwhelming," Holt told Means in a 2012 interview. "The tunnels orient you out in space and frame the view. It brings the landscape back to the human scale." Some have compared the Sun Tunnels with the Spiral Jetty, a land-art work a few miles to the east created by Holt&apos;s late husband, Robert Smithson, who died in a plane crash in 1973. "It is interesting that [the Sun Tunnels] sits on the opposite side of the lake from the Spiral Jetty," said Matt Coolidge, director of the Center for Land Use Interpretation. "You have the more famous, assertive Robert Smithson sculpture on one side, and the more feminine kind of manifestation emerging on the west side of the lake with Nancy&apos;s work. You had the terrestrial work in the form of the Spiral Jetty and the more astronomical and astrological work of the Sun Tunnels on the other side. They complement each other really well in that way." 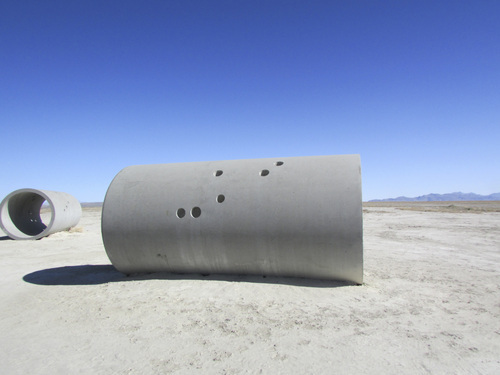 For the few who take the time to explore the Sun Tunnels, the desert experience offers a unique perspective on a desolate part of Utah that serves as a strange sort of art gallery. 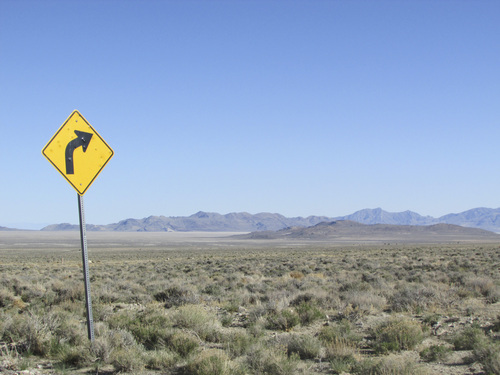 From Interstate 80, take the Bonneville Speedway Exit 4 off Interstate 80 just east of Wendover and head north. The road will make a right angle turn to the right about 11/2 miles from the exit. At that point, bear left onto Leppy Pass Road, which is marked with a sign for the TL Bar Ranch. Stay on the main road, which bears left at the pass. Note the odometer here, and follow this road. It traverses the eastern side of Pilot Peak, passes the TL Bar Ranch, and continues north. Forty miles from the pass you will come to a dirt road heading east at a right angle. Turn right here. The tunnels are visible to the east, a few miles away. After two miles, there will be a road heading south. Take a right on this road. Bear left in a few hundred yards and you will shortly arrive at the Sun Tunnels. If you reach the Lucin ghost town and railroad tracks, you have gone too far. Left • Bianca Visschers and Noortje van Oostrom, from the Netherlands, explore Nancy Holt&apos;s Sun Tunnels in northwestern Utah.